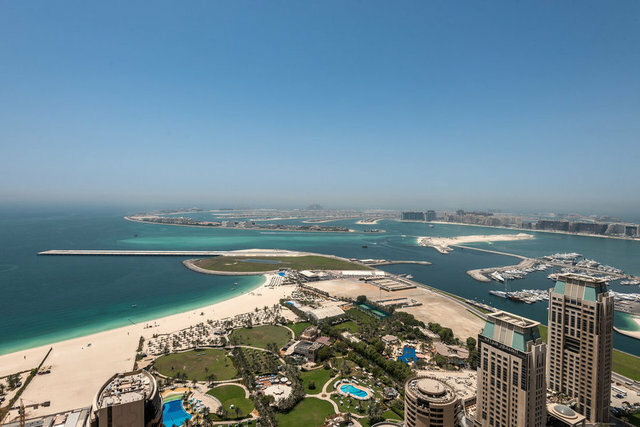 With unrivaled views of the Palm Jumeirah, Dubai Marina and the Dubai Eye, this boutique 5 bedroom penthouse is for the discerning wanting a lifestyle with the beach front, shopping, and restaurants at your doorstep. Situated over 3 floors, it all comes up to the incredible rooftop terrace that includes lounge and barbecue area’s, a swimming pool, upstairs pantry and TV room that all take in the astounding Dubai views. This luxury penthouse has a surface area of 6,635 Sq. Ft. of floor space that results in a feeling of modern contemporary tranquility. Features include the high-end finishing and custom designed and manufactured furniture. With the key finishing’s being the marble and natural stone used throughout. The double vaulted ceiling in the living room with grand chandelier creates a feeling of open spaces from the moment you enter. The penthouse benefits from an abundance of natural light with its floor-to-ceiling glass windows. The apartment is equipped with electronically controlled blinds, along with a custom lighting set-up to create the ambiance of a warm home feel. With the Persian carpets, Jim Thompson fabrics and upholstery, custom artwork the penthouse is rich in design features. All internal systems are of the highest of quality in terms of manufacturing and quality. The spacious balconies own the breathtaking views, as well as offer an ample space for entertaining guests, which is where the homeowner will enjoy spending their time watching the world go by.